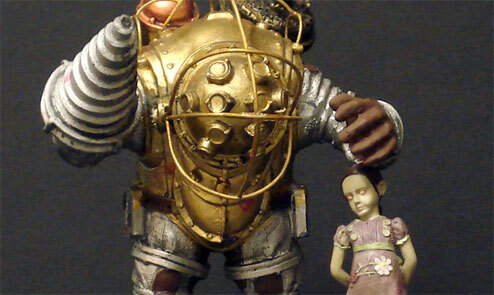 The Big Daddy inaction figure that 2K released with the limited edition of BioShock last year was missing something important. No, not structural integrity. It was missing the Tango to his Cash, a Little Sister. 2K Games plans to remedy that oversight, announcing that a ceramic Little Sister companion figurine is in the works. At three inches tall, she's a perfect fit for the Big Daddy you may already have, but should also blend in nicely with your Hummel collection. How do you get it? Oh, that'd be too easy, spoiling the fun of dragging these announcements out for weeks at a time. Check out the detail pics, remembering that DIY repaints can work wonders.